Ah, the Trickster Deity. The one Who shakes things up, Who always has creative, boundary-crossing solutions to problems. The Trickster breaks the rules, makes us laugh, often embraces The Other by shapeshifting. The Trickster’s tricky ways can have unintended consequences; often unexpectedly positive, sometimes not so much. The Trickster is clever, of mind and of speech, talking us into doing things we might not normally do. The Trickster is also—usually—a male Deity. There’s Hermes, Who stole Apollo’s cattle while still a toddler; and once Apollo got over Himself, He had to admit it was kinda funny and pretty cute. In Native American myth, we meet Coyote, Whose interference made human death permanent and Who is always angling to sleep with the women. In Welsh myth, there is Gwydion Who tricks His sister Arianrhod multiple times to get Her to accept Her son, Lleu. There’s the Spider God, Anansi of West African lore, Who trickily captured some of the most dangerous beings in all of Africa in order to win His powerful stories from the Creator. And, of course, there’s the troublemaker, Loki of Norse myth. He’s so tricky, on at least one occasion, He changes genders to get the job done. Trickster Goddesses are fewer and farther between. We have the Greek Eris with Her golden apple tossing, though generally, She’s more the Goddess of troublemaking and disharmony. 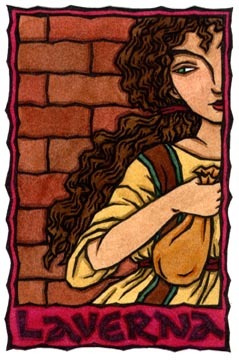 The Roman Laverna is a true Tricksteress, Who tricked a number of people out of their property then got off on a technicality, thus becoming the Goddess of pickpockets and thieves. Yet these are fairly minor Goddesses. In fact, the only major Goddess I know of Who is a genuine Trickster is Isis. Finally, the day came when Horus was old enough to be taken before the Tribunal of the Gods and Goddesses to claim His father’s throne. Almost immediately, Shu the Lord of the Firmament said that Horus’ petition should be granted. Thoth wholeheartedly agreed and He brought out the Holy Eye of Re. But Neb-er-Djer, the Lord of the Utmost, was displeased and He grumbled about the quick decision. The Deities of the Ennead of Heliopolis all quickly put down His objections saying that it was useless to object since Horus had already taken the Royal Name and was wearing the White Crown of Osiris. A great argument now ensued. Thoth spoke for Horus. Re-Horankhti spoke for Set. All the Gods and Goddesses spoke for one or the other. And this contention between the two Gods continued in the Tribunal for 80 years, until all the Deities were tired and bored and cried out, “What can we do? How can we settle this?” But Wise Isis bided Her time. It was decided that Thoth should write a letter to the Great Goddess Neith on behalf of the Tribunal. She, They believed, would know what to do. So Thoth wrote to Her—a beautiful letter full of praises for Neith and polite concern about the welfare of Her son, Sobek the Lord of Crocodiles. 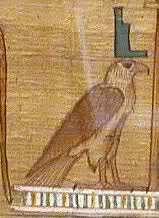 At the very end of the letter, Thoth finally asked what They all wanted to know: to Whom should the throne belong? The Great Goddess straightaway gave answer to the Tribunal. “Give the throne to Osiris’ son, Horus,” She wrote, “and do not commit any injustice or I shall be angry and the sky will fall upon the earth.” Furthermore, Neith instructed the Deities that They should compensate Set by increasing His property two-fold and offering Him Anat and Astarte, the Goddesses of Phoenicia, as wives. All the Gods declared that Neith was obviously right; all but Neb-er-Djer who started the whole argument over again. Soon the Deities were fighting once more, some agreeing with Horus, some with Set. At this, Isis finally became furious. Her anger rose up. Then She Herself rose up, standing at Her full height as fury and flame emanated from Her Divine Form. In the names of Neith and of Ptah-Tanen, the Lord of the Earth, Isis swore a mighty oath. At the words of the Lady of Magic, the Gods were afraid and backed down, placating Her and agreeing that all She had said would be done and that Horus would receive His throne with no more ado. When Set heard this, it was His turn to be angry. He threatened to take His mighty scepter, which no one could wield but Himself, and kill one of the Deities each day. Further, He said He would no longer negotiate with the Tribunal as long as Isis was a member of it. So Re-Horankhti secretly said to the Tribunal, “Come over to the island in the river. There We can make Our decision in peace for We shall tell Anti, the ferryman, not to ferry over any woman who even looks like Isis.” The Deities agreed and crossed over to the island where They sat down to eat a meal of barley bread. Isis learned of Their plan, of course, and She uttered magic words of transformation. Instantly, Isis changed Herself into an old, bent woman, a crone mother. As Anti the ferryman sat on the shore by his boat, he saw what he believed to be an old woman approach him. “I will give you this bread,” said Isis. “Then I will give you this gold ring,” the disguised Goddess said as She took the ring from Her finger. To this rich payment, Anti agreed, and he took Isis to the island. When She arrived, She walked in and out of the trees until She saw the Tribunal eating bread with Neb-er-Djer. Set was there, too, and He caught sight of Her there in the trees, but He did not recognize Her because of the distance between them. Seeing that Set had noticed Her, Isis once more spoke magic words and transformed Herself into a maiden of unearthly beauty. She moved into the open a little to let Set more clearly see Her beauty, then She turned and walked into the forest. Set’s heart instantly grabbed hold of Him. He could eat no more of the God’s pale bread. He could breath no more unless He could breathe the breath of this maiden. He left the Gods to search for her. In an instant—before Set could tell what was happening—the beautiful young woman transformed Herself into the Kite of Isis and flew like the wind to the top of the tree. In His rage, Set had the unfortunate ferryman strung up and beaten upon the soles of his feet until he no longer had any soles. In this story, we see Isis in full shapeshifting Trickster Mode. Isis tricks the unfortunate, yet greedy, ferryman with Her innocent old lady routine. She tricks Set as a blushing young widow, seducing Him to Her side. In this single story, Isis shows Herself as All Goddess, appearing as Maiden (the young widow), Mother (defending Her son in the Tribunal), and Crone (the old woman), as well as in the form of Her sacred bird, the kite. Yet Isis’ trickery is in service to Mâet, what is Right. 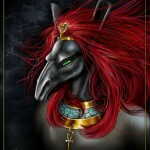 She ensures Horus inherits what is rightfully His. She ensures Set does not. And She teaches that, contrary to the 80s mantra, greed is, in fact, not good. Next Next post: Isis & Sakhmet or Isis-Sakhmet?